As part of the Mountain Collection, Chalet Les Montagnettes offers free ski guiding and coaching with fully qualified Mountain Expert ski and snowboard instructors. Various sessions run throughout the week to introduce you to the ski area and improve your technique along the way. Skiers and snowboarders wishing to take part need to be over 18 (or 12 in school holidays) and be good enough to ski down blue and red pistes. You can sign up for the sessions at the chalet on your first day in resort. The small yet comfortable Montagnettes is perfect if you're a small group of friends or a couple of families looking for a cosy base for the week. The homely atmosphere hits you as soon as you walk in past the coat racks and up into the lounge with the mountain views which draw you to the balcony. Your location is pretty ideal. It's only 50m to the nearest slope (a blue run) and the resort centre is an easy five minute walk thanks to the covered walkways in Belle Plagne. You'll find the equipment hire shop and a good selection of shops and bars in the resort centre too, making for a really convenient stay. There's a small open fire in the lounge which adds to the cosiness, particularly when the lights are low and the tea lights reflect in the huge lounge windows. Sink back into the L-shaped sofa with a drink in-hand and choose to have a chilled night in or head out to enjoy the laid-back nightlife in Belle Plagne. Being an apart-chalet and part of a complex of chalets means that you have access a couple of times a week to the shared wellness facilities. This includes a sauna and hot tub as well as a relaxation area to really unwind. There's a small charge for using the facilities, but this can be paid for locally. Sleeps 9-10 people in 5 bedrooms. Ground floor: One double bedroom with en-suite bath and wc available at a supplement. One twin bedroom with shared separate shower and wc across the corridor (the shower & wc is shared with the 1st floor bunk room). First floor: Comfortable lounge and dining area with fireplace and balcony. One small bunk room, best as a single or for children (shares bathroom with the ground floor twin room). Second floor: Two twin eaves bedrooms, both with en-suite shower and sharing a separate wc. 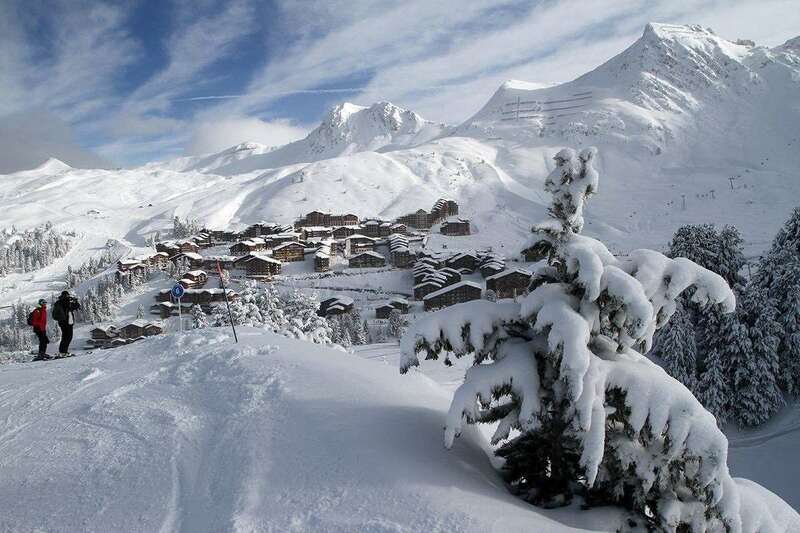 A group of 10 of us stayed in the Chalet Montagnettes in Belle Plagne from 17/1/15 to 24/1/15. We are all novice skiers except for one who is an expert. Belle Plagne offered everything we were asking for. Good skiing with a variety of slopes to suit all skiing levels. Oxygen ski school instructors were very patient and excellent tutors and pushed each of us to the level we were capable of, moving people between classes to ensure we were at the correct level and making sure we were enjoying our experience. However, the best part of out holiday was our chalet host Alistair - Aly. The service he gave us in the chalet was exemplary, fabulous food, good variety, catered to our likes and dislikes. He was friendly helpful, knowledgeable, in fact nothing was too much trouble. I would highly recommend this chalet, there wasn't anything that I could say to improve our experience.